Auction sales are held the 2nd Saturday of every month, with the exception of January, May and November. Come along for a fantastic day out at the sale and enjoy delicious breakfasts, sandwiches, cakes and other refreshments in the cafe. If you plan to visit a Chris Clubley & Co Sale in Melbourne, take the opportunity of enjoying a first class, freshly cooked, modestly priced, breakfast or snack. All proceeds go towards supporting the Melbourne Village Hall. 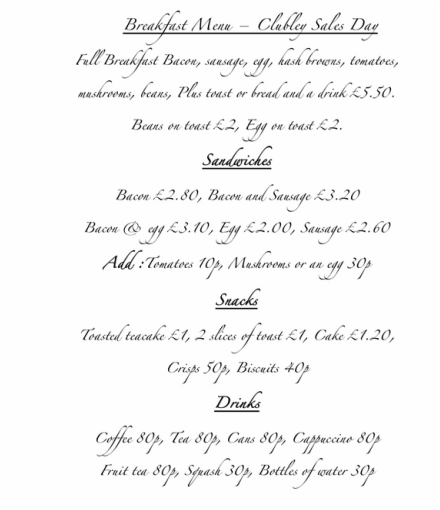 Breakfasts are served from 10.00 am until 1,00 pm after which the kitchen needs to be cleaned and vacated for the use of Chris Clubley & Co staff..